Para información sobre clínicas en otros estados visite bit.ly/daca-clinics (information in English and other states). All volunteers must be able to come in at 8:00am for a 2 hour training. If you can’t attend the training from 8:00 – 10:00am, you cannot volunteer. La Acción Diferida para los Llegados en la Infancia se hizo efectivo el 15 de Agosto 2012. DACA es un cambio el Presidente Obama ha instituído a las polizas de inmigración que beneficiará alrededor de 1.8 millones de jovenes indocumentados en los EEUU y en sólo New Jersey, sobre 60,000 personas. Por medio de la Acción Diferida, los jovenes indocumentados podrán legitimar a su estado legal en EEUU. 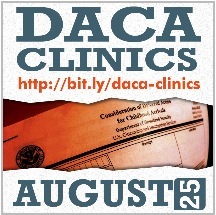 Para despejar a las confusiones e inquietudes de los Soñadores (DREAMers) referente a DACA, la New Jersey DREAM Act Coalition (NJDAC) ha organizado CLINICAS DE ASESORIA LEGAL GRATIS. Nuestro deseo es no sólo informar a la comunidad inmigrante sobre la disponibilidad de DACA, sino también proveer asistencia legal de experta calidad a toda persona interesada. En nuestros clínicas, los interesados recibirán consejería con determinar si se califican para la Acción Diferida y si el programa les beneficiará. A todos que desean aplicar, les proveeremos asistencia inmediata con la preparación de su solicitud DACA. Trás este fin, el próximo Sábado 25 de Agosto, se unirán en clínicas tomando lugar en Newark y Elizabeth de 11:00am–5:00pm, abogados y miembros de organizaciones de justicia social y religiosas, voluntarios para brindar esta asistencia a la comunidad sin costo algún. Ver el anuncio en Univisión. • Este evento no es un foro comunitario. • Este evento no es una sesion informativa. • Esto es un evento para que vengas a llenar su solicitud para la accion diferida completamente sin costo. Para cualquier otra información mande un correo electrónico a carlos@njdac.org. Immigrant youth that meet certain requirements are eligible to apply for Deferred Action from deportation as well as for work authorization permits beginning August 15, 2012. United We Dream, a national organization committed to lobbying for the DREAM Act and supporting undocumented students, has called for a National Deferred Action Application Day on August 25th. 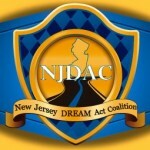 The NJ Dream Act Coalition (NJ DAC), an affiliate of United We Dream, is organizing and training volunteers to assist youth in completing said application at no cost. Sadly, a few attorneys and notary publics are taking advantage of the great need for relief among this population and charging exuberant rates. Please answer this call for volunteers and forward it to fellow organization members. Supervising attorneys from the Center for Social Justice of Seton Hall Law, law students from the Women’s Law Forum of Seton Hall Law, as well as students from the LGBTQ Resource and Diversity Center at Rutgers, have committed to co-sponsor this event with NJ DAC. The event will be held on Saturday August 25, 2012 in rooms 255-7 of the Paul Robeson Cultural Center of Rutgers-Newark, 350 Dr. Martin Luther King, Jr. Blvd, Newark, NJ. Volunteers will receive training from 8:00 – 10:00am to assist applicants with the Deferred Action application from 11:00am to 5:00pm. Volunteers may provide assistance in shifts or for the full day. However, if you are unable to attend the training from 8:00 – 10am you cannot volunteer. 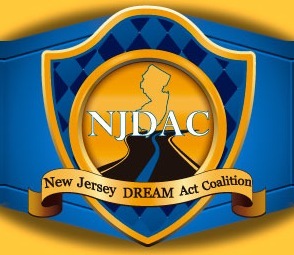 An estimated 40,000 youth may be eligible for Deferred Action in New Jersey alone. 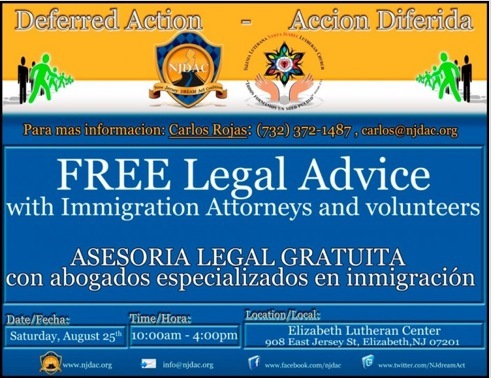 The NJ DAC has announced this event on the NJ DAC website, Facebook, Univision and posted flyers throughout NJ; so a large number of hopeful applicants are expected. We need your help to ensure that every eligible immigrant receives competent assistance without falling victim to scams. Volunteering for the Deferred Action Application Day is another way you can contribute to the work of promoting social justice and to ensure that eligible applicants can contribute fully to our society. Our diversity and acceptance of fellow human beings is part of what makes our country great. PLEASE help get the word out! Share this event and information with your community, friends, and family! Even if not to volunteer PLEASE come to receive FREE legal help to fill out the application! This entry was posted in Eventos, Inmigración, Jovenes, Uncategorized and tagged Acción Diferida, DACA, DREAM Act, estado legal, legitimar, Obama, poliza de inmigración. Bookmark the permalink.